DStv Explora to the internet. Discover thousands of hours of extra DStv Catch Up titles. From 1000 movies brought to you by M-Net, to more episodes of your favourite series, box sets, kids’ entertainment galore and more. This content is downloadable (via the internet) for you to watch in your own time. DStv Catch Up Plus is exclusive to DStv Premium customers. Get access to Showmax and binge-watch unmissable entertainment – with 25,000 episodes, movies, full box sets and kids’ entertainment. Included in DStv Premium at zero cost. R99 per month for all other customers. Have the convenience of being able to schedule recordings when you’re away from home. How do I connect using the WiFi Connector? How do I connect my DStv Explora to the internet? How do I connect directly using my ethernet cable? An internet connection at home with an uncapped connection. A minimum 2Mbps is required for downloads or remote recording. For SD viewing, a minimum of 4Mbp is required. For HD viewing (and the best experience), a minimum of 10Mbps is recommended. There are two ways to connect your DStv Explora to the internet. Using an Ethernet cable: If your DStv Explora is in the same room as your router, or if you want to connect the two directly, you can link them using an Ethernet cable (available from any electronic store). Using a DStv WiFi Connector: If your DStv Explora isn’t in the same room as your router, or if you want to avoid running a cable from your router to your DStv Explora, you can connect them using a DStv WiFi Connector. Before starting, ensure that your internet router is switched on and connected to the internet. Now insert a standard Ethernet cable directly into the green Ethernet port on the back of your DStv Explora and then insert the other end into an available Ethernet port on your router. The DStv Explora will now automatically run the set-up wizard and test connectivity to the internet. Once you’ve connected your DStv Explora to the internet, you can check connectivity at any time. Press the HELP button, select Tools, then select Connectivity Checker. Place your computer close to your router. Turn WiFi off on your computer. Using the supplied power cable, connect one end into the USB port on your computer and the other end into the power input on the back of the DStv WiFi Connector. Using the supplied ethernet cable, insert the one end into the Ethernet port on your computer. Now insert the other end into the Ethernet port in the back of the DStv WiFi Connector. Open the web browser on your computer and type http://dstvWiFi.local/ into the address bar. Select your router from the list, enter your wireless password and click 'Connect'. Disconnect the DStv WiFi Connector from your computer. Using the supplied ethernet cable, insert the one end into the green Ethernet port in the back of the DStv Explora. Now insert the other end into the Ethernet port in the back of the DStv WiFi Connector. Using the supplied power cable, connect one end into the USB port in the back of the DStv Explora and the other end into the power input in the back of the DStv WiFi Connector. The Power LED on the front of the DStv WiFi Connector should light up solid amber and then change to a solid white, confirming the DStv WiFi Connector has power. Wait two minutes. The Wireless LED on the front of the DStv WiFi Connector should light up solid white once an internet connection has been established. Press HELP on the remote. Select 'Tools' >>> 'Connectivity Checker'. Press OK.
Press BACK to save your settings. Connect the cable on the docking station to the USB port on the back of your DStv Explora (if your Explora has a USB port on the side, don’t use that one). Insert the DStv WiFi Connector into the docking station and place the docking station next to the decoder. (The DStv WiFi Connector can also be connected directly to the USB port on the back of your decoder, however this may impact signal reception). The LED on the DStv WiFi Connector should now be solid white (confirming that it has power). The DStv Explora will now automatically search for WiFi networks and display the available options. Press OK on the remote to select your WiFi network, then press OK again to connect the DStv Explora to your WiFi network. If your WiFi network is not found, move the docking station to a position where it is most likely to receive a WiFi signal. If your WiFi network is still not found, check that your router is switched on and connected to the internet. If your WiFi network has a password, enter the password now. You can enter the password using the alphanumeric buttons on the remote control, or by pressing ALT to use the onscreen keyboard. If your password includes a character that is not on our onscreen keyboard, please change the password on your router. If you enter the password incorrectly, the screen will show an error message (Incorrect password. Please try again). Please delete the entered password and try again. The DStv Explora will now automatically test connectivity to the internet. DStv Catch Up Plus offers a variety of shows and movies that are not available on DStv Catch Up, including Box Sets of selected series. Check out the DStv Catch Up Plus Series Calendar to plan your viewing. Data charges apply when the DStv Explora is connected to the internet and an uncapped connection is recommended. A minimum 2Mbps is required for SD downloads or remote recording. For SD viewing, a minimum of 4Mbp is required. For HD viewing (and the best experience), a minimum of 10Mbps is recommended. 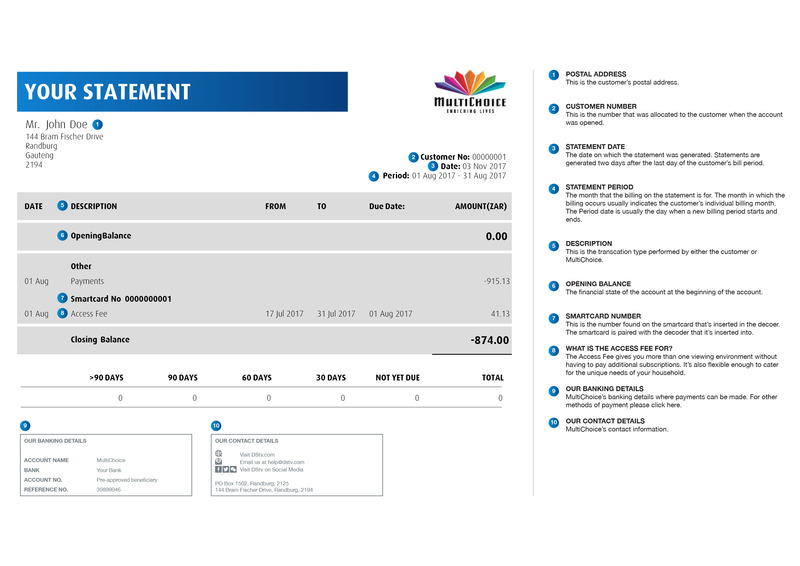 Full use of the DStv Explora, including features when it is connected to the internet, requires an active subscription and payment of a monthly Access Fee. Downloading of video consumes large amounts of data so please be aware of your data package limits and costs. MultiChoice will not be held responsible for data usage. Data charges apply for all downloads, including failed downloads. Once you’ve switched on these features, we recommend the DStv Explora stay connected to the internet at all times. MultiChoice cannot be held liable for any interruption to features on the internet connected DStv Explora as a result of a fault with your internet connection or internet service provider. Remote recordings are available to any customer with a DStv Explora and an active subscription (that includes payment of the monthly Access Fee). Remote recordings require a Connect ID. Remote recording is available on selected programming within the next eight days. Remote recordings are given the highest priority on your DStv Explora and any conflicting scheduled recordings are cancelled (and automatically rescheduled where possible). DStv Catch Up Plus content available when you connect your DStv Explora to the internet is exclusive to DStv Premium customers with an active subscription (that includes payment of the monthly Access Fee). The DStv Catch Up Plus content downloaded via the internet uses up your available recording space. Data charges may apply for all DStv Catch Up downloads, including failed downloads. Please provide a name and a surname. A call centre agent will be in touch with you soon!